Congratulations to Ms. Evon Henry of Martin Luther King, Jr. Elementary, selected as this week’s Teacher Spotlight! Ms. Evon is a native of Bridgeport, Alabama. She has five brothers, four sisters, and thinks of herself as the baby girl. When she isn't teaching, she loves engaging in fitness activities. She says that she has been blessed with two wonderful children, Thomas and Bryanna, and she greatly enjoys teaching children to read. Ms. Evon says that she likes to include all of the different learning modalities in her instruction, adding that "some kids learn by listening, and some kids learn by verbalizing." Often the students in her classroom work in "centers," where they might have to talk or listen to other students as part of the activity. One of the great moments in the classroom, according to Ms. Evon, is "when I'm teaching, and they are looking at me [...] when I see the light come on and their face just lights up." Neriel Ford, one of Ms. Evon's students, says "I like to read and do math with her, because she helps a lot." 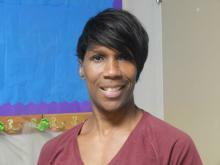 According to Ms. Lynette Alexander, the Principal at Martin Luther King, Jr. Elementary, the students "want to please her, she has high expectations for them." Each week, ETV will showcase an outstanding Huntsville City Schools educator as a feature in the “Teacher Spotlight." Highlighted recipients receive gifts from SchoolCraft and Five Guys.